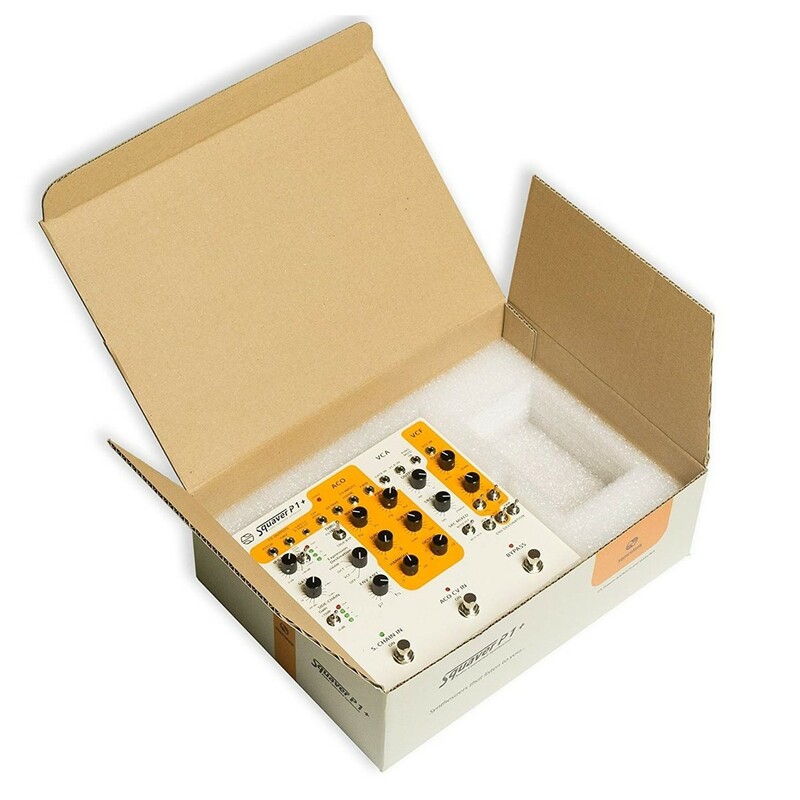 Versatile analog synthesizer pedal with semi-modular design. 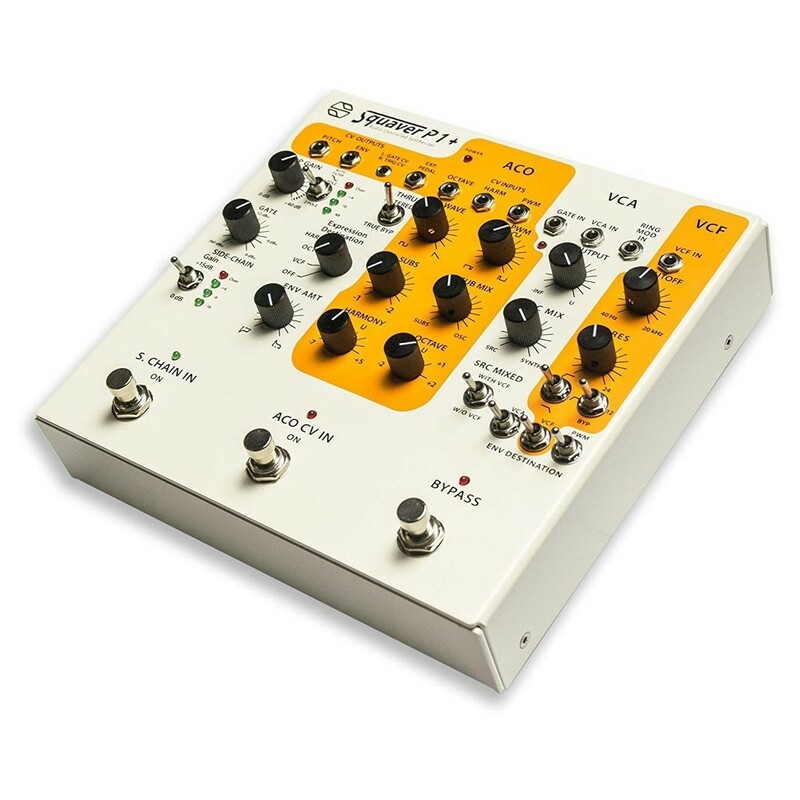 The Sonicsmith Squaver P1+ Synthesizer is a highly compact synth pedal featuring a single oscillator with expanded functionality. 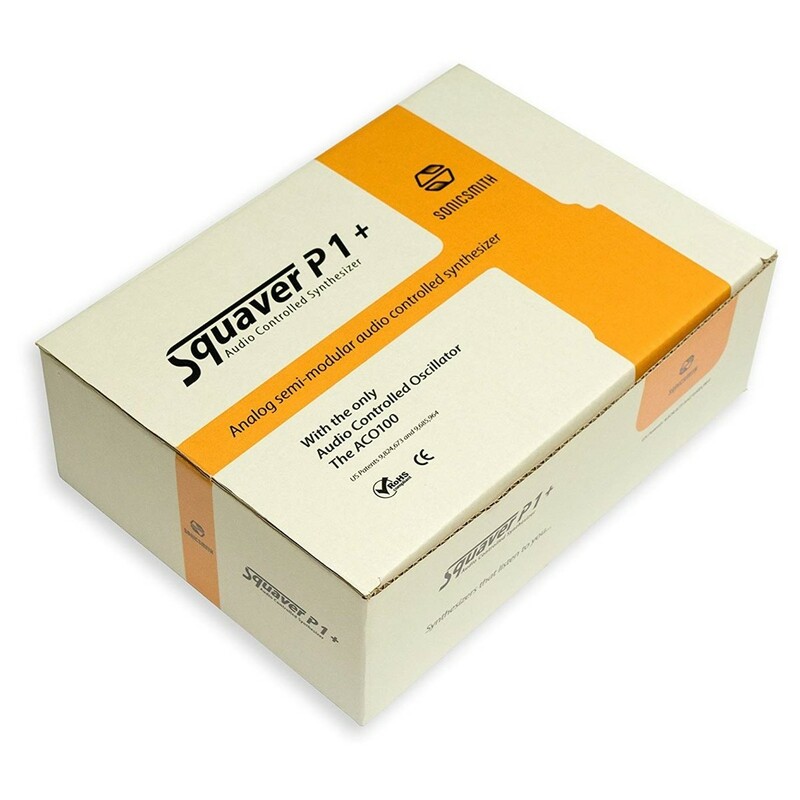 The Squaver P1+ is perfect for use in any live modular setup. It allows you to extract gate, pitch, envelope and trigger CV data from the audio input. A variable resonant filter features LP, BP, HP, 12 / 24dB oct settings with CV input control. 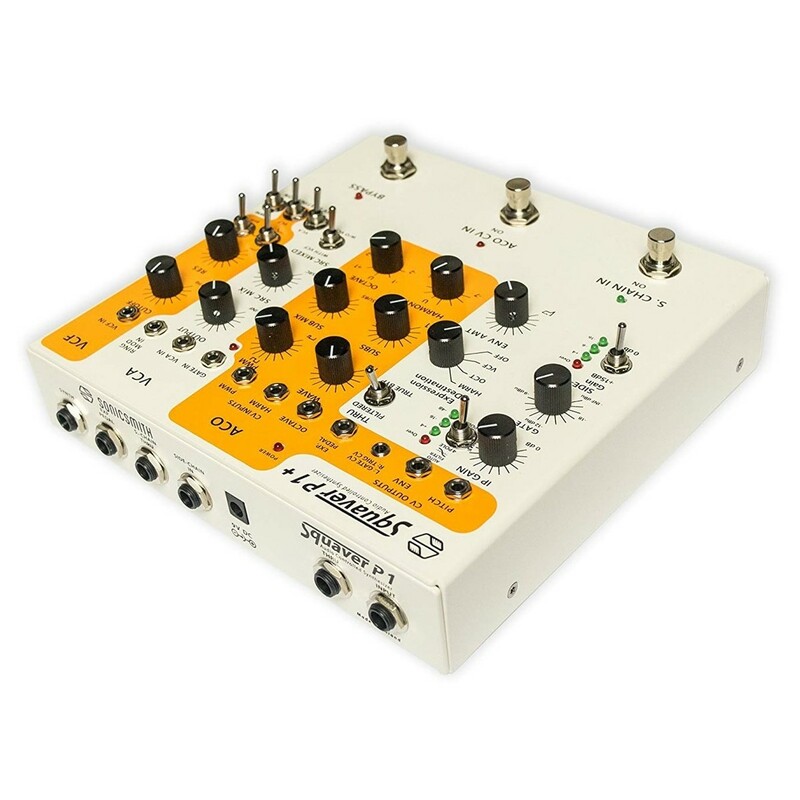 It is the perfect centrepiece for any modular setup, fusing together analog audio and CV performance. The compact, guitar-pedal style design makes the Squaver P1+ highly portable. The integrated preamp allows you to incorporate instruments and microphones for controlling sounds. 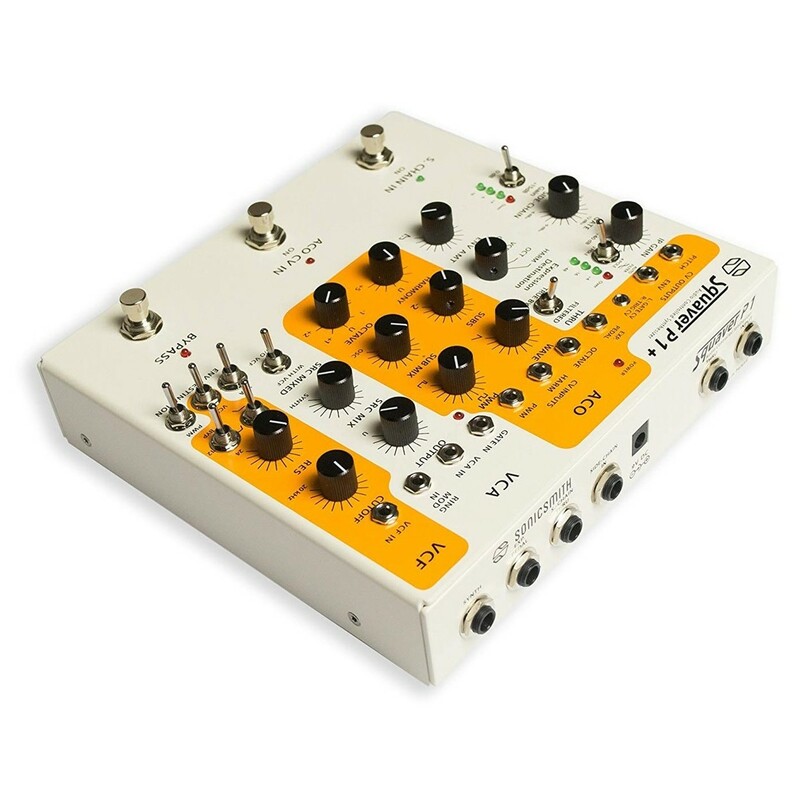 It provides you with a total of three audio inputs, five CV outputs and six CV inputs for maximum versatility. The Squaver P1+ builds on the original design of the Squaver, expanding its functionality with a variable gate, wider sweep PWM and a smoother envelope. The Squaver P1+ features a single ACO1000 oscillator chip, one of the only audio-controlled oscillators available. Unlike conventional oscillators, ACOs utilise the audio input signals. To achieve the sound. You can blend between square and sawtooth waveforms using the onboard mix knob. It also features dual envelope followers which can be freely assigned to various parameters. One of the most unique features is the patented auto-adjusting filter. This specialised filter can work in both two pole or four pole configurations. The integrated input preamp, providing powerful and clean sound reproduction, with up to +40dB of gain. This allows you to control your synth using line-level sources, electric instruments and dynamic microphones. This allows you to interact with your synths like never before, controlling tones and sounds by playing instruments or singing vocals. 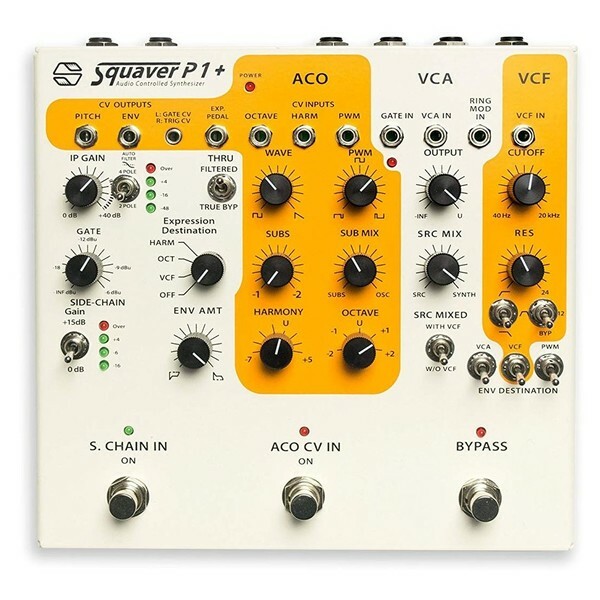 The Squaver P1+ includes a wide variety of analog and CV connections. It is perfect as the centrepiece of any synth setup. In addition to the audio input, the Squaver P1+ features a side-chain input, which provides access to the second envelope follower. It can also be utilised via a footswitch for added versatility. Three thru jacks are included, giving you the ability to daisy-chain multiple units. This allows you to record the source directly. The ring modulation audio input invers the synth phase at the audio input’s frequency. Five CV outputs and 6 CV inputs are incorporated, including two CV inputs for harmony shift and octave shift. 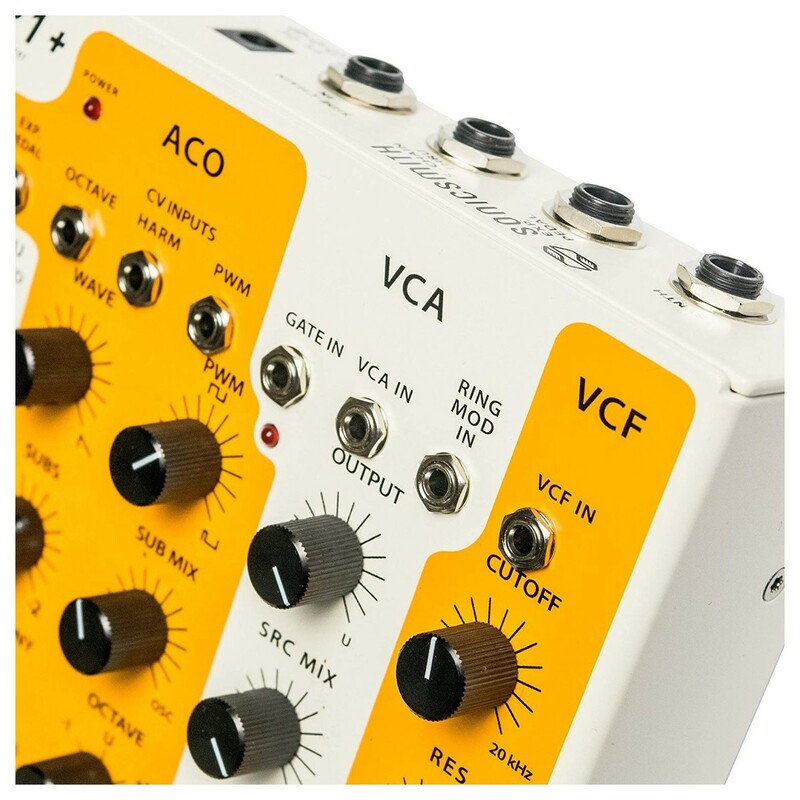 You can also control external CV sources such as analog sequencers and LFOs. The compact design makes the Squaver P1+ highly portable, ideal for use on the road or in the studio. It features an ergonomic layout with a guitar pedal style faceplate. The full metal construction provides optimal durability, with the robust and rugged enclosure. The dual four-character LED meter, provides visual indication for the main input and side-chain input. This allows you to check your levels at glance, ideal for live performances. The synth pedal is operated via a (V battery of a standard 9V pedal supply (not included).